35768LF-SS is rated 4.3 out of 5 by 10. Rated 5 out of 5 by llgray from Simply Beautiful I bought three of these for my bathrooms several months ago. I love it and it’s even more Beautiful installed on my marble vanity. Thank you Delta. Rated 4 out of 5 by Mike from A few things to make installation easier. 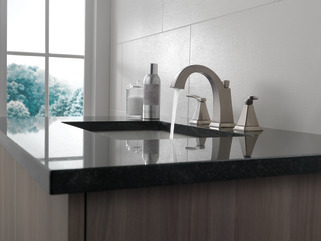 Bought this at Lowe's because the style and finish went well with the Mayfair vanity we ordered. A couple of things I learned doing the install. 1. If you have a medicine cabinet installed on the wall over the sink, be sure you have enough clearance to drop the lift rod through the hole in the spout. 2. Check the two screws holding the spout to the base. Mine were loose, which I didn't discover until I have the spout installed. Lock washers or Loctite might be overkill. 3. Install the spout first. The mount rod is on the left and if you put the hot water faucet in first the tubing gets in the way if you're using a wrench. If you have a deep 7/16" socket, no problem. 4. Use double stick tape to hold the gasket and bracket to the bottom of your basin. Gravity still works under the sink and it's annoying to have them keep falling down when you're trying to get the nut started. 5. Same thing for the washers under the faucets. 6. Steps A & B are obviously reversed. Even I figured that one out. Really liked the quick disconnect tubing, a lot faster than wrenches and fittings. Rated 5 out of 5 by pep147 from Very nice styling. Looks nice with our application Just had both faucets installed today and everything works. Only thing I think needs added is hot and cold marking on handles. Rated 1 out of 5 by Austin from LEAK Machine Installed less than 6 months ago, pours water out of the back of the faucet. 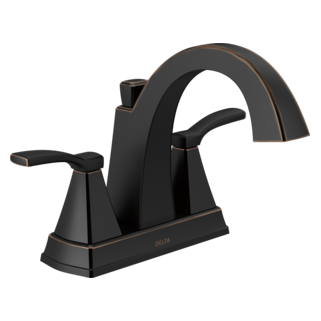 Rated 5 out of 5 by Mary from Great Looking Faucet Nice mix of modern and classic elements. In looking at our remodel, our neighbors commented on how well the fixtures blended with all the cabinet hardware. 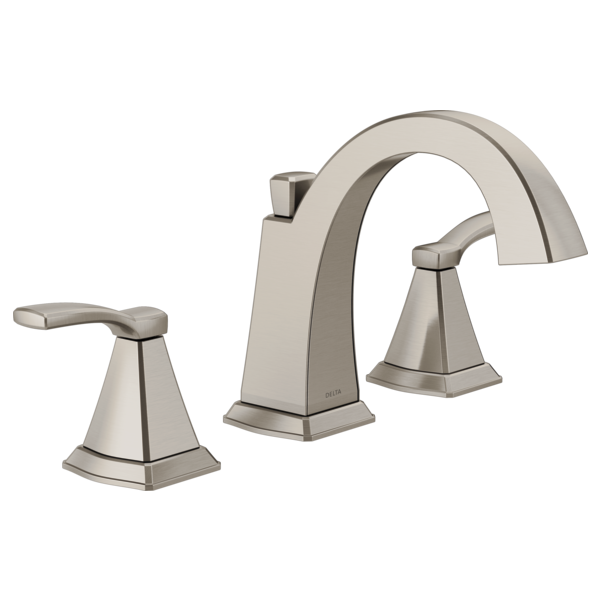 Rated 5 out of 5 by Toomanychoices from Sleek Design Looked for a replacement for two bathroom faucets. Had to be a widespread model. Sleek Design. I prefer a chrome finish but this is available in nickel finish as well. I liked that the drain stopper lever was at the top of the faucet instead of behind it because I didn't have a lot of clearance from the faucet to the granite backsplash. The price was reasonable too. Rated 5 out of 5 by Sheysa71 from Clean lines! I love the clean lines! I remodeled my bathroom and this was perfect. It’s a delta so more props! My plumber said it was easy to install so i think that’s a bonus. the one handle needs to be tightened. How do you tighten the handle on this model? 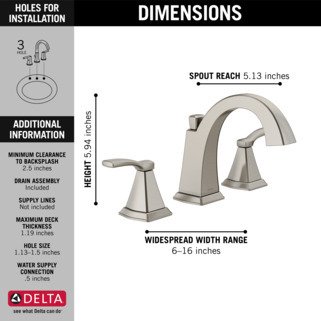 Can I use the RP10612 extensions for this faucet so that I can increase the deck thickness to 2.19&quot;? Are there matching shower fixtures for this design? I can't seem to find the RP91142-1.2 aerator and wrench. What size is the aerator? M24x1, M21.5x1, M18.5x1 or M16.5x1? Has this been discontinued? I can't find it on Lowe's website.